Jennifer Suchan plays the piano, loves Beanie Babies, and enjoys a good Harry Potter thriller. And she loves the motion of an amusement park ride, a roller coaster, say, or a ferris wheel--just like any other nine-year-old. 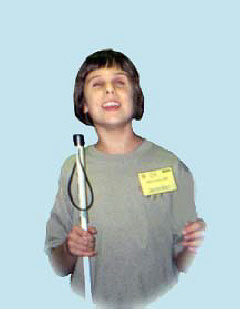 About the only thing that makes this bright-faced Potomac fourth-grader stand out is the white cane she uses to get around. Jennifer is blind. Mention that to her, and she has a quick reply: "Who cares? Big deal." On Tuesday morning it became a big deal when the operator of the Jolly Giant ferris wheel at the Montgomery County fair told her she couldn't board the ride without an adult--because she was blind. Other children--sighted children--of the same height, however, could ride on their own. "I was stunned," her mother, Suzanne Suchan, said yesterday. "It was as if he had said, `Lady, you can't go on that ride because you're a brunette.'" "I felt kind of left out," Jennifer said. "I wanted to go on that ride even though I was blind. I felt he was wrong." The incident sparked a heated discussion between the mother and the ride operator and led to the filing of a formal complaint against the Montgomery County Agricultural Fair for denying the girl access to the ride. Suchan said she also will file a discrimination complaint with the Montgomery County Human Relations Commission, which she already has contacted about the incident. Officials at the fair in Gaithersburg said the ride operator acted properly, out of concern for the girl's safety. Unlike other rides, they said, this ferris wheel, which rises seventy-five feet into the sky, does not have safety straps to secure riders. Sighted children who meet the 42-inch height restriction may ride alone, but 54-inch-tall Jennifer and other blind children may not. "The ride operator was looking out for the best interests of the child. She was not denied access at all. She was asked to have an adult present during the ride," said Brad Thomas, the manager of the carnival at the fair. "If something happens during the ride, and she stands up or panics, there could be a devastating accident." Yet disability law specialists interviewed for this story said Jennifer should have been allowed to get on the ride by herself. "It would be a violation of the [Americans With Disabilities Act] to deny access on that basis. The amusement park would have to show that a child riding alone would somehow create a direct threat to themselves or to others," said Gary Phelan, a disability law specialist from New Haven, Connecticut. "I can't think of any conceivable argument where someone sitting down and riding around and around in a ferris wheel would pose a danger to anyone." "I don't see any plausible explanation to why she should be denied a ride, and I think the ADA is pretty clear on that," said Mark Richert, who works in governmental relations for the American Foundation for the Blind. "If it's safe enough for nine-year-olds who can see, then it's safe enough for nine-year-olds who can't see." Still, others said the issue is not clear cut. Susie Storey, communications manager for the International Association of Amusement Parks and Attractions, which represents fixed-site amusement parks and not fairs, said judgment calls about allowing children to ride unaccompanied have to be weighed on a case-by-case basis. "Safety is paramount," she said. "If someone recommends that someone else be there on the ride, it's for the best interests of the child." Suchan said her daughter has been on countless amusement-park rides. The family goes to the fair every year, and they just recently returned from a trip to Busch Gardens--where a spokeswoman said yesterday that blind children may board any ride that sighted children may board. "We had purposefully looked for a ride that wasn't too fast. And here was this slow-moving ferris wheel. Jenny would have no problem with that ride whatsoever," Suchan said. She, however, did not want to ride with her daughter because she does not like heights. "I'm chicken." Jennifer did, in the end, get to board the ferris wheel, but only when three women who had been standing behind the Suchans in line decided to offer to ride with the girl. For Mom that was not the point. The Suchans are not planning to take any legal action or seek any damages over the incident, she said. "I really want this just to be an education and to make sure it doesn't keep happening to other kids. People need to come out of the darkness and into the twenty-first century." I applaud the Montgomery County Agricultural Fair for insisting that Jennifer Suchan be accompanied by a sighted adult while riding the ferris wheel ["No Solo Ride for Blind Girl," Metro, Aug. 17]. Ferris wheels do not come equipped with seat belts or any other mechanism for restraining passengers. They rely, instead, on psychological barriers to encourage riders to stay seated. Telling a blind 9-year-old that she cannot ride unaccompanied and unrestrained in a seventy-five-foot-high amusement ride is not the same thing as prohibiting a sighted woman from riding because she has brown hair. Jennifer Suchan has confused safety with civil rights. According to the U.S. Consumer Product Safety Commission, 10,000 people were treated in emergency rooms for amusement ride-related injuries in 1999. Two-thirds of those victims were children. According to industry sources, rider mistakes and misbehavior are responsible for 65 percent to 85 percent of all accidents. A simple mistake cost my 5-year-old son half his foot while riding a kiddie roller coaster at Disneyland. He confused a temporary stop with the final stop and tried to get off the ride. Amusement ride accidents happen when you least expect them, and they can have lifelong consequences. As long as carnivals and amusement parks are held legally and financially liable for rider safety, they must be allowed to determine who can safely board their rides and under what conditions. The ride operator at the Montgomery County fair made a well-reasoned decision to put Jennifer Suchan's safety first. I am the father of Jenny Suchan, the blind nine-year-old who was not allowed to ride the ferris wheel without an adult at the Montgomery County Fair [Metro, August 17]. I am writing in response to the August 24 letter from Kathy Fackler, who supported the decision of the ride operator and the fair organizers. Ms. Fackler cites statistics on amusement ride accidents and recounts a tragic incident involving her son. I nevertheless respectfully argue that her letter misses the point. No one disputes that there is risk involved in amusement rides, but the vast majority of children injured on such rides--and we presume Ms. Fackler's son as well--were not blind or handicapped in any way. The only reason our daughter was prohibited from riding the ferris wheel without an adult was that she was blind. At the same time that Jenny was denied permission to ride alone, other children were on the ferris wheel who were younger, more immature, and even more rambunctious than our daughter--and none of them was accompanied by an adult. If there were an accident or if the wheel stopped, my daughter would have been more likely than these other children to stay where she was until someone came to help. Being blind does not make someone, even a child, more likely to act impulsively or recklessly--much the opposite, in fact. If the ride operator had required all children to be accompanied by an adult, then the safety argument would hold water. But all he saw was my daughter's white cane, and for him that was evidence enough that she could not be trusted to act responsibly. He was wrong. The letter from Jenny Suchan's father ["Grounded by Prejudice," Sept. 3] and the earlier story about her ["No Solo Ride for Blind Girl," Metro, Aug. 17] all add up to much ado about nothing. Are we so open-minded that our brains are falling out? To say that the ferris wheel operator concluded that Jenny could not be trusted to act responsibly is an insult, and to make a social statement out of his response to Jenny's blindness is ridiculous. All the operator did was decide not to take a chance that something would go wrong that he then would be held liable for, plain and simple. It was a judgment call, not a deliberate act of discrimination. Can't we leave it at that? There you have it. If you assumed the days of unthinking discrimination at the amusement park were over, remember the Montgomery County Fair. It would also be a good idea to keep in mind that members of the general public are still likely to draw faulty conclusions from the facts when they are asked to set aside their prejudices. On the other hand, we are making some progress. Read the following story and remind yourself that despite setbacks we are still moving forward.